Every mix comes together differently. Indie Summer Boogie organically came to life as a continuation of the Sunday Vibes mix I dropped last month. On that one I left off in the 98 BPM boogie world after climbing from 74 BPM over the course of an hour. I figured it’d be a good point to cut because a new groove was starting to form, and I wanted a separate canvas to let it all marinate. Less two days after recording Sunday Vibes, I did Indie Summer in one take. I had an hour free before heading to a gig and the turntables were ready, so I hit record. After about 30 listens, I still really like what I’m hearing, so that means I should probably put it out. To have a sustainable career as a working DJ I need to stay on top of a lot of different formats. My favorite style is what you hear on this mix. It’s my interpretation of new meeting old. With the vastness of the internet, there are no shortage of remixes that’ll freshen up a classic and make it workable in unlikely spots. There are also remixes of new tracks that’ll totally soften that predictable pop sensibility and make it feel “cool” again. All of this goodness loosely fits in the category of nu-disco or indie dance, I’m told. The best part is that it brings a seemingly endless amount of genres under one umbrella. It makes it a lot easier to go from Biggie to Moby in one move without totally changing the vibe. Or Chromeo to the Rolling Stones. 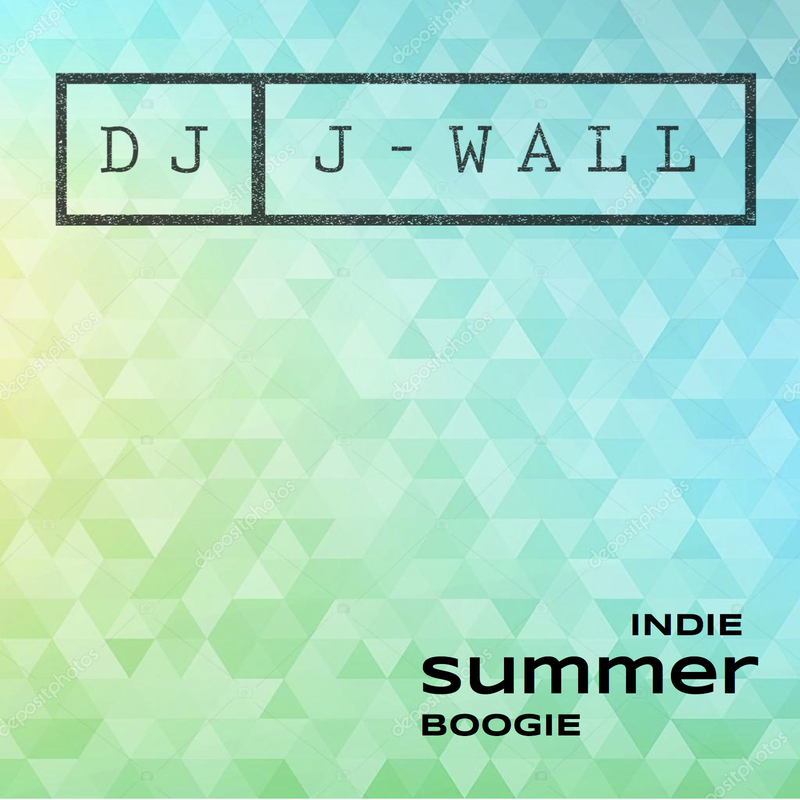 Indie Summer Boogie is currently streaming right here on my site and on Mixcloud too. If you’d like a download link, please send me a direct message! The full tracklist is below. I want to give a huge shoutout to all of the amazing remixers and editors. Without you my sets wouldn’t be nearly as interesting. You all are inspiring me to get working on my own edits, too. “Weak” (Dennis Blaze 4AM Remix) – S.W.V. 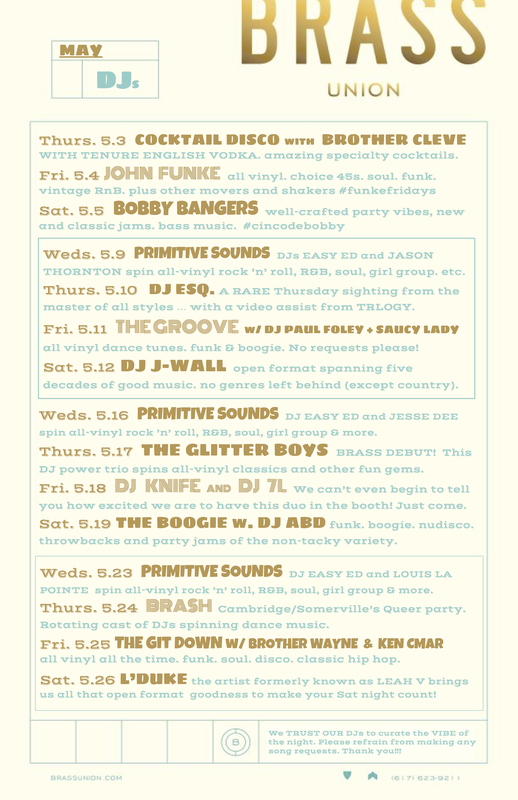 I am looking forward to another solid month of DJs at Brass Union and especially excited for DJ Knife and 7L’s Friday appearance on 5/18. It’s always on honor to be able to book my heroes. 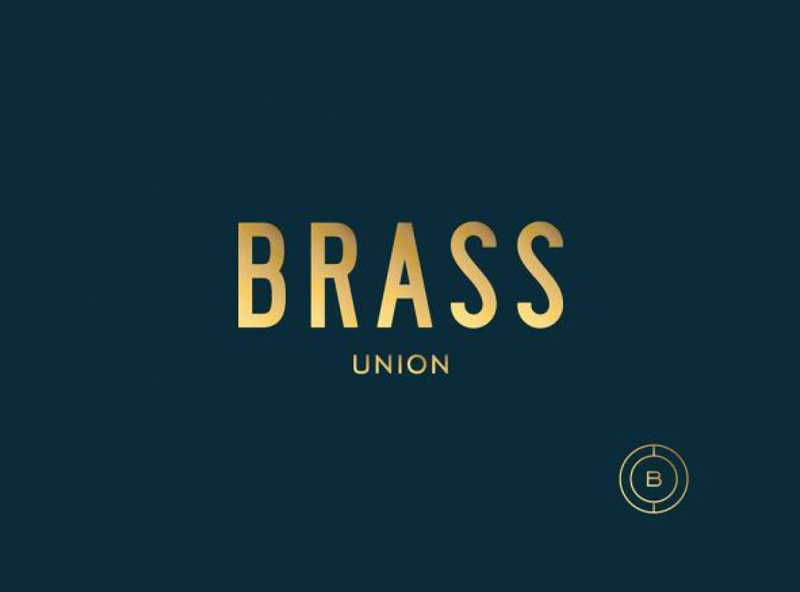 I’ll get my shot at the controls on Saturday the 12th, and Brass is always one of my favorite places to spin. The crowd is way more open-minded that most spots, which allows me to weave in and out of unexpected genres (like ’90s alt rock) without loosing the room. The last few sets I’ve done here have been wild … and I expect nothing less this time around. As always there’s never a cover.